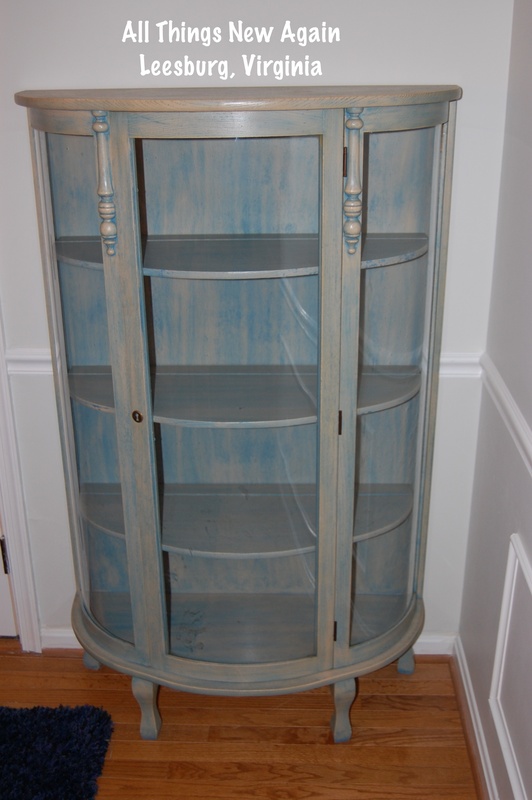 China Cabinet Redo Idea: No-Paint, No-Sew and Awesome! I promised my mom I wouldn’t paint my grandmother’s vintage china cabinet so I needed to come up with another china cabinet redo idea to make it fit with my home decor. Luckily, my mom had a great idea I could easily re-create for my home (and you can too!). 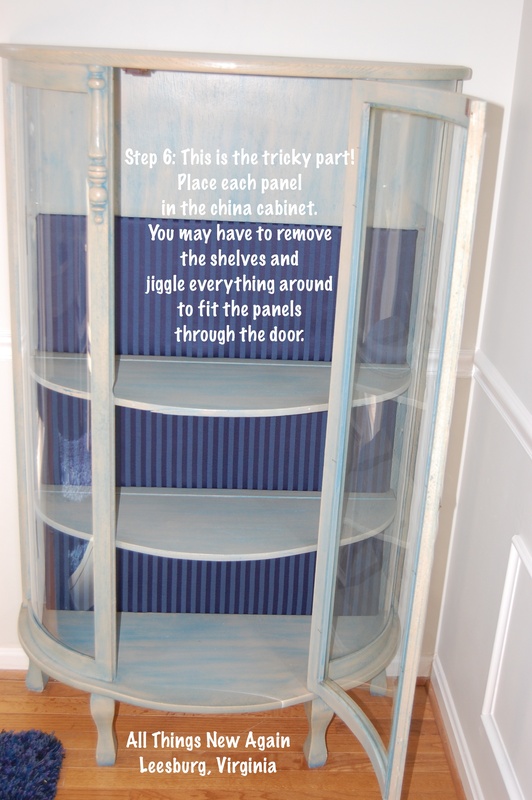 Grab your glue guns for this no-paint, no-sew, super-cheap, super-easy awesome china cabinet redo idea! My mom and I paint furniture for sale at our store All Things New Again in Leesburg, Virginia so it’s very rare that we don’t paint a piece of furniture. But this piece is special. This china cabinet belonged to my grandmother and still features the light blue tint from a DIY “antiquing kit” my grandfather used in the early 1980’s to give it this beautifully unique finish. We didn’t want to cover it with paint, but the color didn’t quite fit in my dining room makeover. 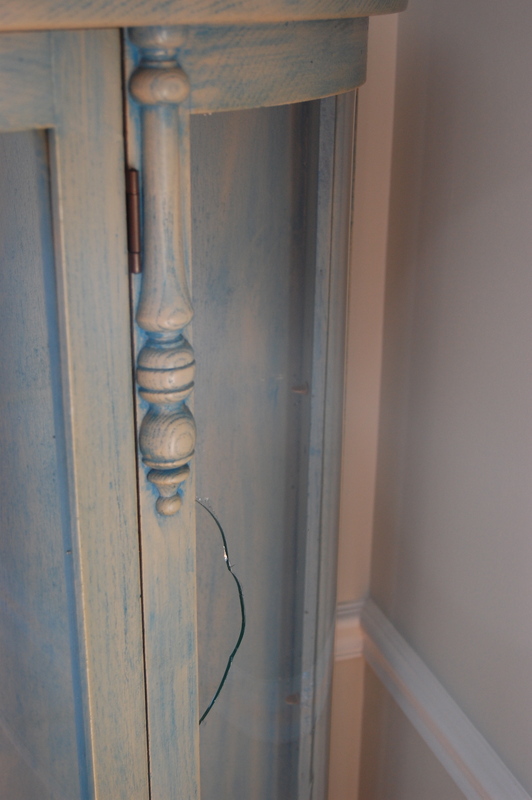 I used my Mom’s china cabinet redo idea as my inspiration for this project. Mom’s white dishes weren’t showing up so well after she painted her china cabinet white so she created a pretty backdrop by covering foam board with floral fabric. 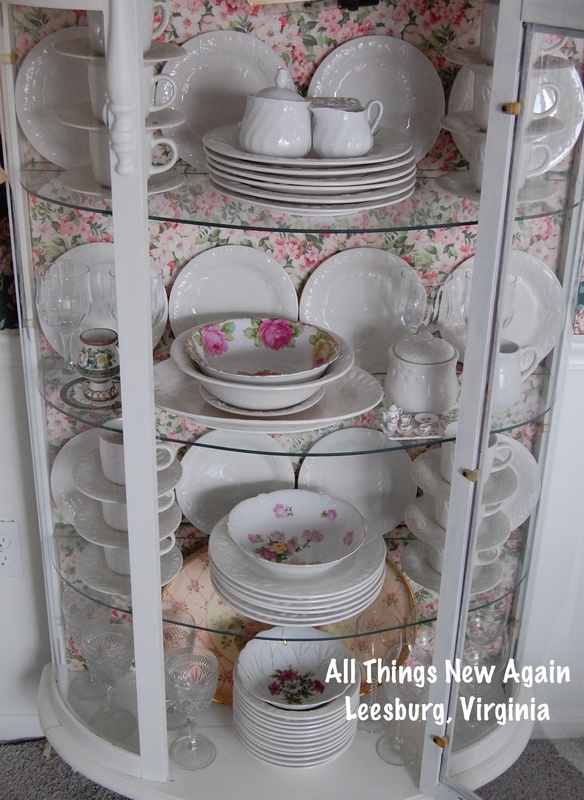 Not only is this china cabinet redo idea super-cheap and super-easy, it is also temporary. When you are ready to change looks, just pop out the panels and toss them. Step 1: Start by measuring the space for each panel you are creating to figure out how much fabric and foam board you will need. I measured each panel separately. I’m glad I did because although the height of each section looked the same at first glance, they actually varied by as much as an inch when I measured. I used one piece of foam board per panel and fabric leftover from my dining room chair seats. I bought the foam boards at the dollar store so this project cost me a whopping $4! Woo hoo! NOTE: The space in my china cabinet was 31 inches wide, but the foam board was only 30 inches. No big deal. I cut the height to fit and just centered the completed panels in the space. You don’t really notice the little bit of wood showing on the sides, especially after the dishes are in place. Step 2: Cut the foam board. I used a cutting board and this fabric-cutting tool that looks like a pizza slicer for quick and clean cuts of the foam boards. 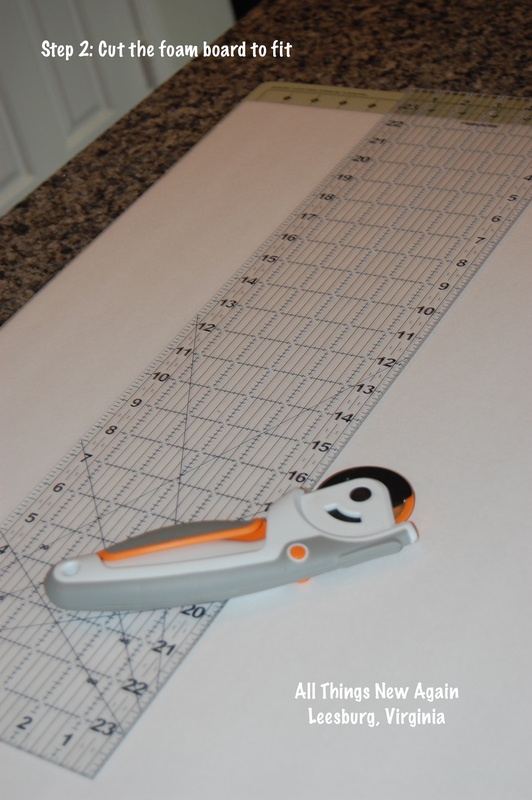 I’m not a quilter, but these two tools come in handy for so many different projects. You could also use scissors. Step 3: Cut the fabric. 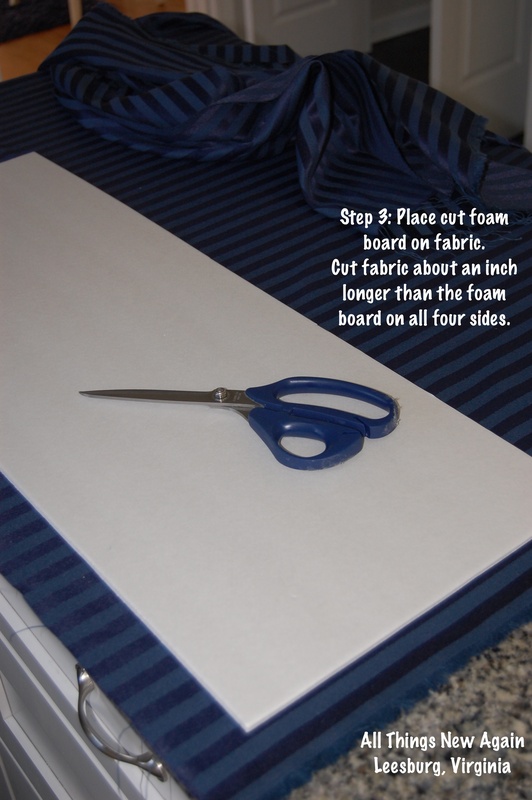 Place your cut foam board on a piece of fabric and cut the fabric about an inch longer than the foam board on all four sides. You don’t have to measure this exactly. Just eyeball the fabric and make sure you have enough to fold around all four sides of the foam board. Steps 4 and 5: Glue the fabric to the foam board. 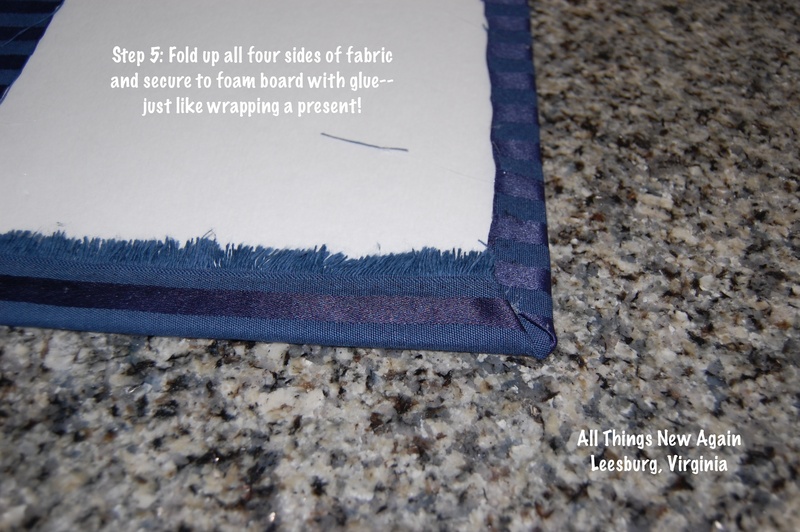 Next, fold the fabric around the foam board and secure with glue. I like to start by securing the corners and then folding up the sides of fabric just like wrapping a birthday present. 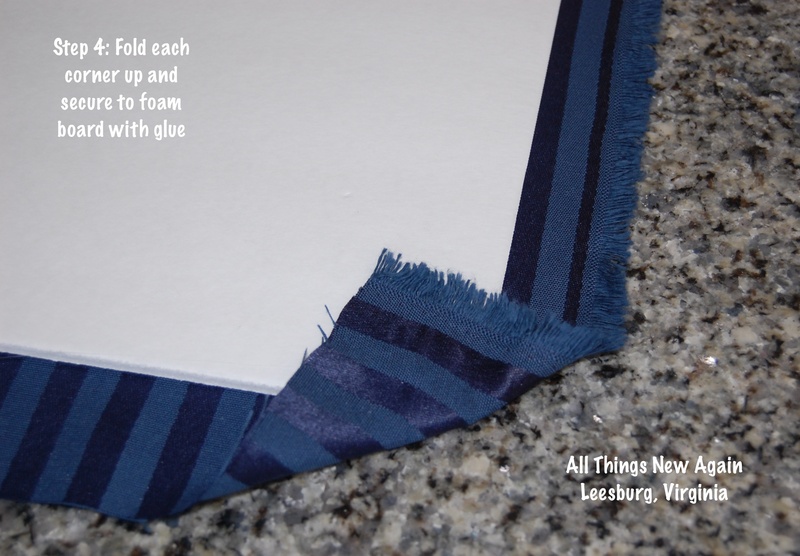 Make sure you pull each side tight so the fabric does not look saggy in the front. After gluing down all four sides, your panel is complete and ready to place inside the china cabinet. This was the trickiest part of the entire project. I had to remove the shelves to make room for the panels to fit inside the china cabinet door. Then I jiggled everything around to get the panels and shelves back into place. It would probably help to have an extra set of hands for this step. A photo of the finished project beautifully decorated with my grandmother’s china should go right here. Here’s what happened: The china cabinet is old and needed some repairs. The glass is held in place by molding along the inside of the panels, but the molding had come loose in several sections. Some sides were completely loose so the glass was just jammed in there unsecured. I was afraid the glass would eventually fall out, break and somebody would get hurt. So we decided now would be a great time to make the repairs while the china cabinet was empty. Then I could wash all the dishes, arrange everything beautifully and shoot my Big Reveal photo. Easy peasy. Instead, we accidentally punched a big hole through the glass on one side. The Big Reveal photo will have to wait until we can get a new glass panel installed. If you are looking for a china cabinet redo idea, fabric-covered panels are a super-easy and super-cheap makeover. You can make them to fit any type of cabinet or bookshelves, adding a pop of color to a room without the long-term commitment of paint. Another china cabinet redo idea is to create seasonal panels to trade out throughout the year. It might look awesome to have Christmas fabric in the background to show off Christmas dishes. Hmmm… that might be my next project. Just be extra-careful if you try to make any repairs! 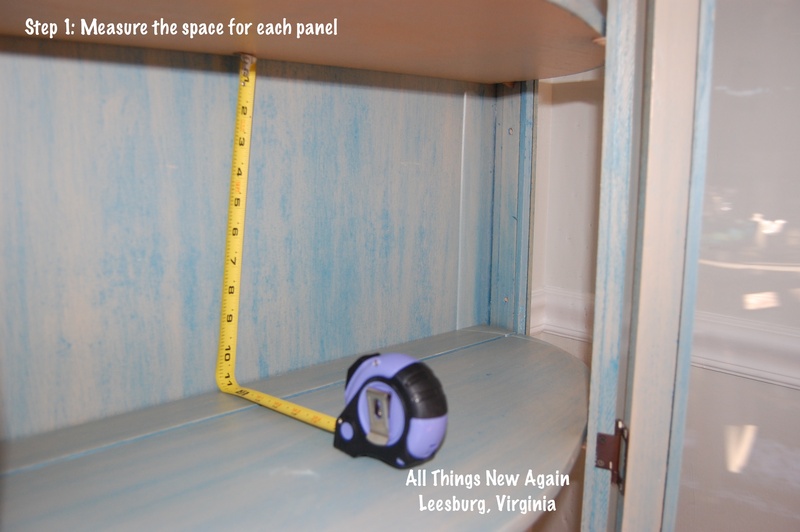 All Things New Again is a family-owned furniture and paint boutique in Leesburg, Virginia (about an hour or so west of Washington, D.C.) offering hand-painted furniture, home decor and several lines of paint for your next DIY project. We love helping people make their homes pretty!